Analyze your websites performance easily every time you step in the admin interface of your website. 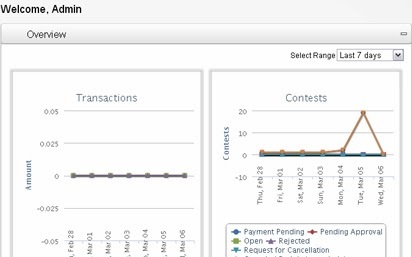 Just one glance is enough to view graphical admin stats like user login, contest, entries, transactions, user registration, etc. Each statistics is broken down in such a way that, it provides you maximum details easily. You can measure the success of your website and take stern actions to improve it as well. Every feature of this script is developed by taking acute care. They provide various layers benefits to you. Check out all the features of this script and experience the richness of it.